It was hard to pick a second D1 driver to do a small retrospective on, following the post on Ueo's career as a professional drifter. There are just so many great drivers in Japan to choose from, but after much deliberation it just had to be Nobuteru Taniguchi. Taniguchi is one driver I have great respect for, having managed to build a racing career with his own two hands, starting off in small one make racing sereis making it all the way to Super GT. In fact as I write this he is preparing to make his debut at this weekend's World Touring Car Championship (WTCC) round in Okayama circuit on board of the Proteam Motorsport BMW 320si. But away from his high-profile Super GT and Super Taikyu career Taniguchi is of course known for drifting, winner of the first ever D1 Grand Prix season in 2001. 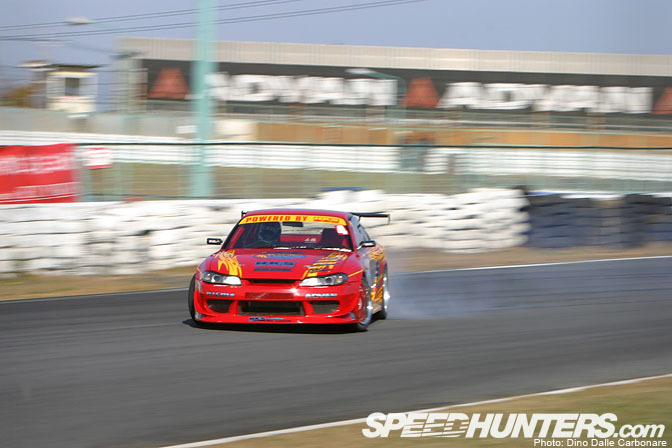 The car that made him into a drift star was the HKS S15 Silvia above, one of the most recognized drift cars of all times. Taniguchi, originally from Hiroshima, started practicing the art of drifting with his AE86, becoming known for his crazy aggressive style, made famous by a video his friends shot of him one night as he drifted an incredibly tight touge in the mountains above Hiroshima. …by setting themselves a new challenge. The build of the HKS Altezza was previewed in Option Magazine, becoming the first D1 car to truly be built from the ground up like a race car. However this was to mark the demise of HKS's dominance in D1, and due to problems with the new car Taniguchi missed out on winning the 2004 championship coming in second, after failing to qualify for the last two rounds. NOB or No One Better as Taniguchi likes to be called, is short for Nobuteru, but also hints at his skills behind the wheel! 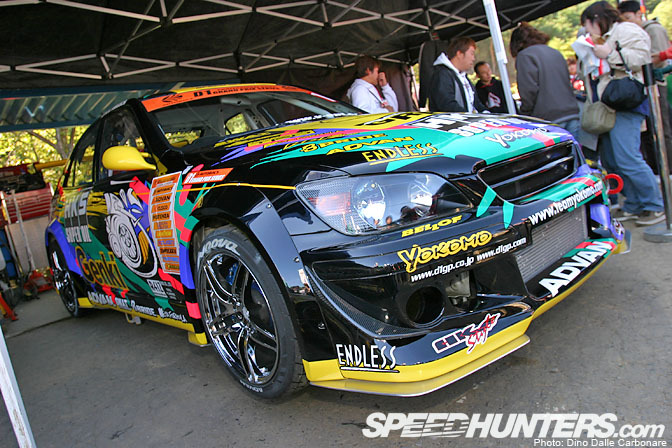 The debut of the SXE-10 Altezza was at the 6th round of the 2004 season in Ebisu, seen here sitting in the paddock sporting the old-school HKS livery. 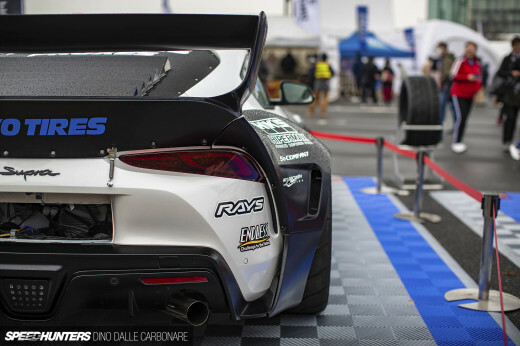 Under the dry carbon hood lay a 3S-GTE initially developing 480 HP thanks to a GT2835 HKS turbo, and then 540 HP when it was upgraded to an HKS GT30 Pro. The engine was strengthened with a 2.2L stroker kit and fitted with a Valcon system to control the variable valve timing. The 2005 season proved even less successful as the team struggled to make the car competitive with Nob ending the year in 10th position. But the car looked great and the fans continued to support Taniguchi's efforts in attempting to get back to a competitive level. Here is Nob heading to the pits at Round 2 in Odaiba. At the end of 2005 HKS decided to pull out, ending its involvement with the D1 Grand Prix. HKS didn't distance itself from drifting completely however, participating in exhibition runs during MSC drift events like the one held in Odaiba back in 2006 where I snapped this picture. The Altezza was sporting new colors and an upgraded engine, now developing 560 HP thanks to the larger HKS GT3037 turbine. 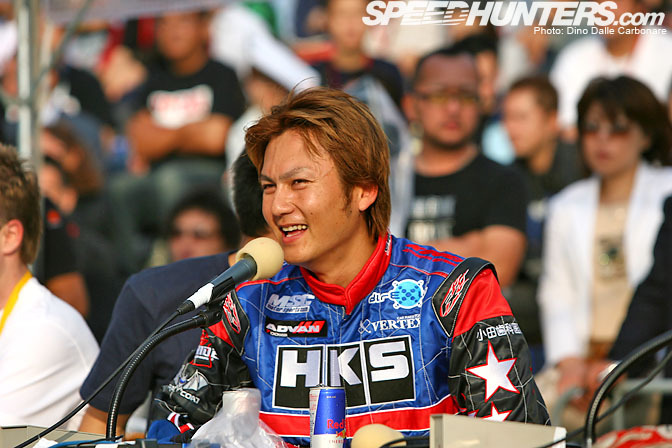 During this time HKS and Nob concentrated on their time attack attempts with the Evo CT230R but continued to put on drift exhibitions with MSC, often together with Manabu Orido and his HKS Supra or Aristo drift cars. To gauge its competitiveness HKS entered the Altezza in the Fuji round of D1 last year, where Nob struggled to keep up with the more powerful machinery, ending the day in 9th position. It was rumored that HKS would enter more rounds during the course of the year but that never actually happened. I'm sure that with some more time the Altezza could've been made to perform just as well as the better D1 cars out there, after all HKS is HKS and when they want to win they usually get their way! Taniguchi remains a celebrity in Japan, a professional driver that has never forgotten his roots and that enjoys every aspect of motorsport. He continues to work as a presenter/driver in video magazines like Hot Version and Video Option and of course continues to compete in the GT300 class of Super GT at the wheel of the RE Amemiya RX-7. 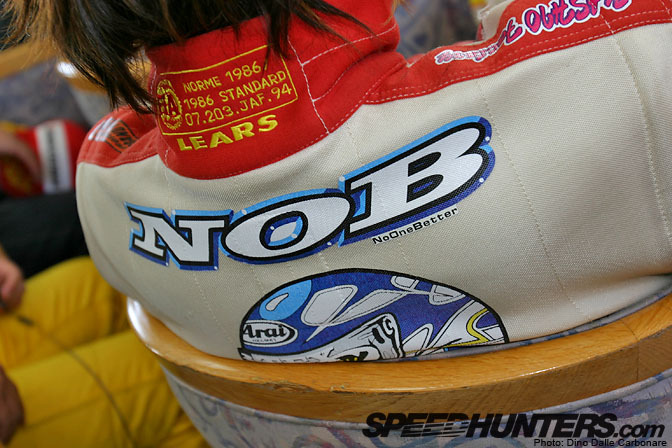 I for one am looking forward to the day that Nob returns to D1, he had an unmistakable style and would really like to see him battle it out against today's top drivers. For now the exhibitions he puts on for crowds at various events will have to do! If he's after the money then D1GP is not attractive at all. I've met him once and he is simply awsome ! C'mon, it ain't about the money. He always says it's about his schedule. You can't blame him cause he races in too many events. I mean this guy's amazing. In time attack events, he drives say, the Top Fuel S2000 for a few laps, then next, he sets the record with the CT230R. That's wicked cause it's hard to switch cars and get used to them. Not only he gets used to it, he sets records with it. AMAZING! I like the old school HKS livery even if I know it's ugly. Hehe. Oh, that Vertex Ridge aero plus the Super Advan Racing ver. 2 wheels is a killer combination! NOB is a great driver, don't get me wrong. But I just don't think that drifting is really his thing. Super GT is where he really is in the zone. I'd like to see him in D1, but I'd like to see him more in Formula Drift. Also a note should be made. After 2001 D1GP banned the use of slicks. If NOB was used to those, that could have meant his demise from that point onward. 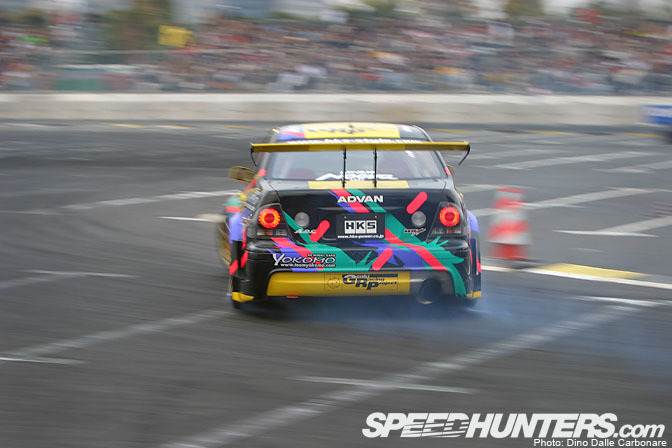 Now do a feature on Kazama, that man is a true drift legend. WOW!now one of his S15's is now WASTING away with C.WAN behind its seat:-(the HKS demo/drift ARISTO is also siiiick! How about a RETROSPECTIVE on KAZAMA? 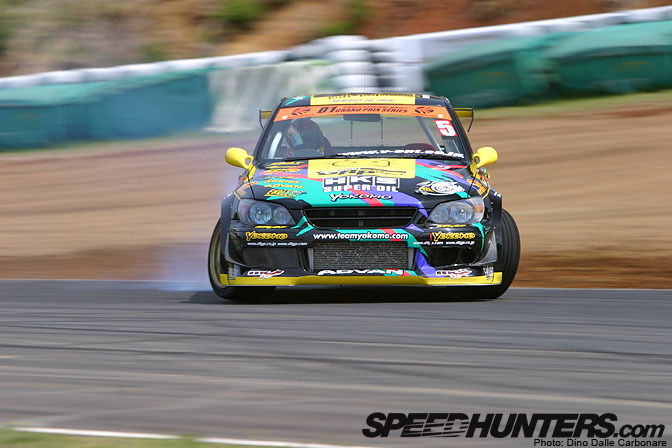 NOB was always one of the best D1GP drifters because he was always the fastest at entry speeds and overall drift. He would charge into the corners like no other! i miss that kind of drifting! NOB has always had the overall fastest speeds in drifting! he charges into the corners like no other! 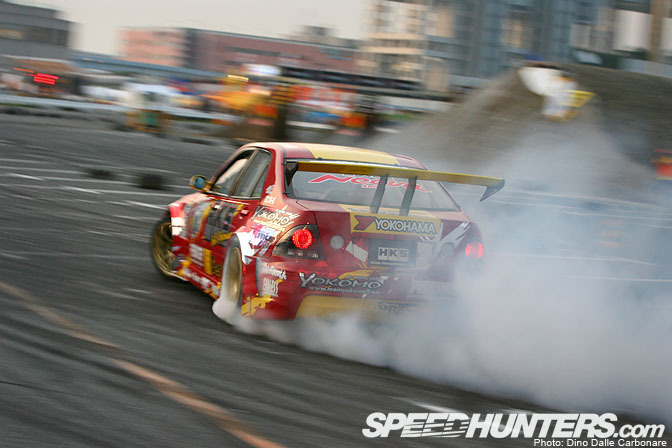 I miss that kind of drifting! Although he MAY not run along with the new high level drifting as well as he used to, his versatility is almost second to none in the D1 ranks. If you ask me, the engine isn't a 3S-GTE - it's a boosted beams blacktop 3S-GE. If I remember correctly, HKS was selling a turbo kit for the beams blacktop, I guess they used it on this car. The thing that doesnt make him win is his Altezza or even his Aristo. I believe the suspension geometry of the car is not the best for drifting. If he uses S15 again, he would have more possibilities to win again. Love his drift with left foot brake technique, amazing. Wow, didnt realise alot of those photos were by you! got loads of those in my achives saved away! awsome stuff! but could someone tell the information about T & E and NOB? does NOB somehow concerns to T&E? .and his storied up-and-down career in D1. Keep up the good work!